Fluffernutters are my childhood. Literally, my entire childhood. If I had to choose one thing I loved as a kid, it would be fluffernutters. (Well that would be my sweet pick, if I had to choose a savory it would be tater tots. Tater tots all the way). If you’re not familiar with fluffernutters, allow me to explain this marvelous invention to you. They are sandwiches made with white bread, peanut butter and marshmallow fluff. Delicious right? I think I’ve mentioned on several occasions that my mamma isn’t much of a baker. Somewhere out there, at this very moment, my mamma is saying, “Yes, Jonathan. You’ve already mentioned that I didn’t bake anything for you and your sisters when you were little, on several occasions. Any chance you get. 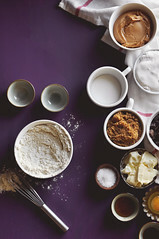 Stop telling the whole world I can’t bake!” I’m sorry mamma, but it’s true, and if it makes you feel any better, it’s not really the whole world. It’s like a few people here and there. Anyhow, my mamma didn’t really bake when my sisters and I were kids. Have I told you that? She didn’t at all. Cut and bake cookies, do those count? Anyhow, she did however, make us a few treats here and there, like jell-o (hmmmm), Rice Krispies treats (yummm) and lastly, flutternutters (coma inducing deliciousness). The fluffernutters that my mamma would make my sisters and I, however, weren’t the traditional kind I described earlier. Unfortunately she didn’t make us whole sandwiches because I think she knew it would basically be a sugar rush and we’d be jumping off the walls for hours if she had. Whomp whomp. She’s a smart woman. She knew what she was doing. 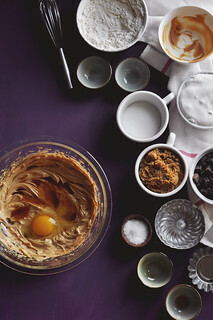 Instead, she’d take two ritz crackers, spread creamy peanut butter on one, and marshmallow fluff on the other, and then sandwich them together. It was the best thing on the planet. I could eat like fifty of them. I even think one time I challenged myself to see if I could actually eat fifty in one sitting. I only got to like eight, but needless to say, I’m still trying to challenge myself. I’m up to like nine now. It’s going to take me a while. 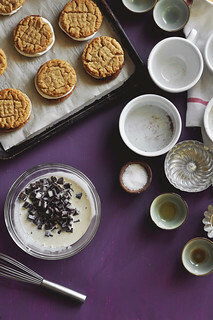 This past week, I wanted to bring back a bit of my childhood, so I came up with these cookie sandwiches. Mostly I just wanted an excuse to eat marshmallow fluff and peanut butter straight out of the jar without getting caught. I did that for a while before I realized I needed to save some for the cookies. Darn you cookies (but not really because you’re super delicious and I just want to keep you all to myself). I’m trying to devise a plan that would allow me to eat all these cookie sandwiches without giving my mom or doctor a coronary. So far, I got nothing. 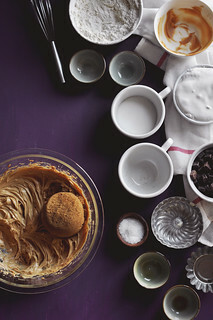 Until then, if you need me, I’ll be tucked away in a corner sneaking a cookie sandwich here and there, trying my best to outdo my record for most fluffernutters eaten in one sitting. Okay so maybe these cookies are a little over the top. 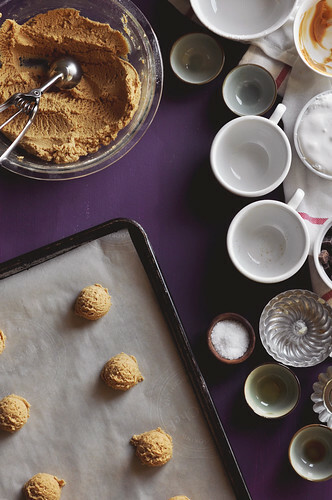 Perhaps they can be a special occasion cookie for you. 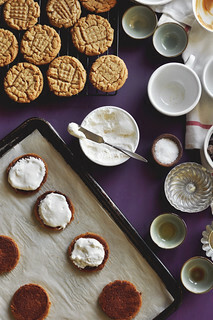 Cookies you only make on those really important holidays or birthdays or celebrations. Or on those special days, like Friday. Cookies you give to someone to cheer them up and put a smile on their face. I don’t know about you though, I’m all for any excuse that allows me to eat two cookies at once, with marshmallow in the middle, partially dipped in chocolate, and sprinkled with salt. We mustn’t forget about the salt. That was based off a friend of mine who has told me on several occasions that she needs to eat something salty right after eating something sweet. Then she craves something salty again, and then it’s back to a sweet craving. Basically it’s a never ending cycle. I want to be on that cycle. 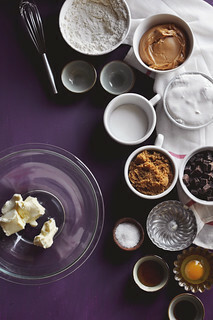 We start our cookies by mixing together the dry ingredients. It’s pretty much a basic cookie recipe. One I’m sure you’ve seen on several occasions. Nothing fancy here. 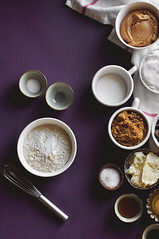 In a small bowl, whisk (or sift) together the flour, baking soda and salt. Set the dry ingredients off to the side. 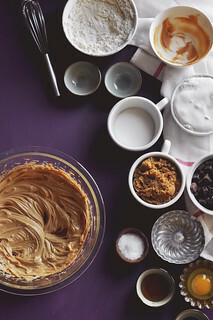 Let’s turn our attention to more important things like butter and peanut butter. Notice that the word butter is there twice. Those are dreams people. Delicious magical dreams. 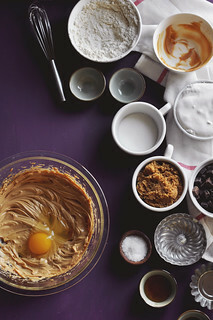 In a large mixing bowl, cream together the butter and peanut butter. 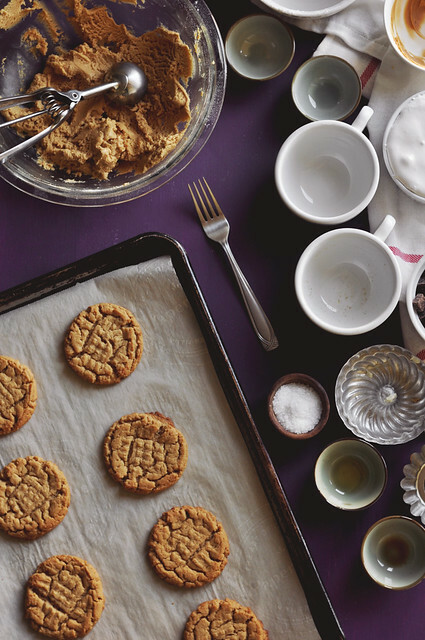 I found a honey roasted peanut butter jar at the store and I yelled out loud, “AH HAH!” After the initial excitement passed, I realized that the honey roasted peanut butter would be perfect for these cookies, so I grabbed a jar (or three or eight). 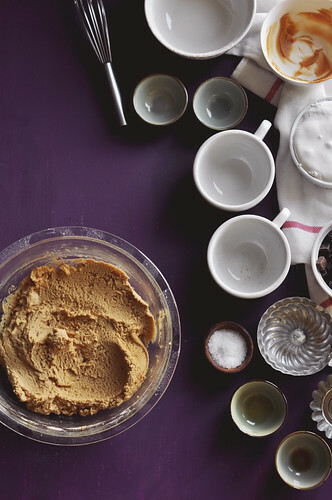 Whip on high until super creamy and velvety and smooth. So you know when you’re in the kitchen, baking up a storm and you’re in the zone, I don’t know, maybe singing a song out loud. I’m just throwing out hypotheticals. 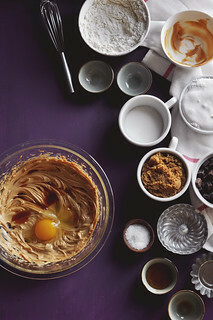 Anyhow, maybe you’re on a chair singing, “Total Eclipse of the Heart,” or something, and you’re really into it so you’re not paying attention and you accidental add the egg, vanilla and honey before adding the sugars to cream. 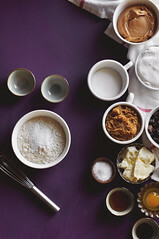 Maybe you’re in the second verse singing, “I’m living in a powder keg and giving off sparks” and you’re just mixing the ingredients together and then you look over and you realize the sugars are still in their bowls, and it dawns on you that you should have creamed the sugars first? Has that ever happened to you? NO? That has never happened to me either. Pssssh. I don’t even know what you’re talking about. Let’s pretend for a second that this has happened to you (it’s never happened to me, it’s all you). You don’t have to panic. You can add the sugars after the egg, vanilla and honey. That’s totally cool. The dough isn’t ruined. You haven’t set off a ticking time bomb or anything. So just add the sugars after and mix. Add the dry ingredients from earlier and stir until just combined. Scrape down the bottom and sides of the bowl, as needed. Right now the dough is really soft. Cover the bowl in plastic wrap and place it in the fridge for at least half an hour, to allow it to firm up. This will make sure the cookies don’t spread out too much while baking. Once chilled, use a small ice cream scoop to scoop out the dough onto baking sheets lined with parchment paper. I like putting about 8 cookies per sheet. Leave enough space for spreading. Press down the balls lightly with the palm of your hand, then use a fork to make a criss-cross pattern on the top. Bake for about 10 to 12 minutes or until lightly browned on the edges. Rotate the pans, top to bottom, front to back, halfway through baking, to ensure even browning. Remove from the oven and allow to cool on the baking sheets before transferring to wire racks to cool completely. So the cookies are completely cooled, right? Not, meh they’re a little warm but I’m a little impatient, cooled. They’re cooled, cooled. 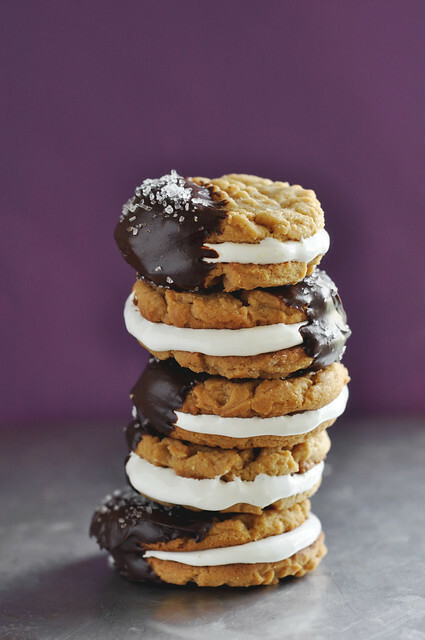 Turn all the cookies over, spread half of them with marshmallow fluff. Just pile it on. 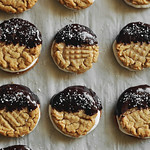 Then sandwich them together with the other half of the cookies. Don’t mind my cookies, they got a little too brown at the bottom (I may or may not have been singing again). I can feel the judgment. They’re still good. Let’s make a ganache in the meantime because if there’s one thing I’ve learned about life, it’s that you’re not done until you’ve dipped the cookies in chocolate. Am I right, ladies and gentlemen, or am I right? Throw some dark chocolate into a bowl. Cover with hot heavy cream. Allow to sit for a bit, whisk until melted and completely smooth. And glossy. And shiny. 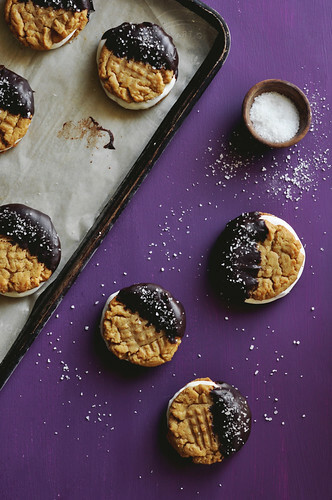 Dip the set and firm cookie sandwiches into the ganache. Only partially dip them, like one side of the cookie dip. Let’s not get carried away and take them too far. One side is plenty. Then sprinkle the chocolate with a bit of sea salt, because we’re trying to be fancy here. I like to place the cookies back into the freezer for a bit so that the chocolate hardens faster. Feel free to do the same thing. I actually just keep them there because I like eating them frozen. If they get too hard, you can let them thaw out for a bit. I think that at room temperature they get a little too messy to eat. Maybe I’m just weird. 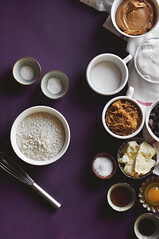 If you’re not feeling the whole marshmallow filling and chocolate dipping and sea salt sprinkling, then you can easily omit all those steps and take the recipe for what it is. 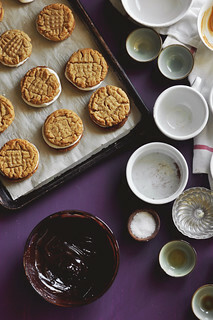 A really delicious peanut butter cookie recipe. The cookies by themselves are very tasty, especially if you’re a big fan of honey and peanut butter, mushed together in holy matrimony. Try to get a hold of some of that honey roasted peanut butter that I found, you won’t be sorry. You’ll become addicted, so maybe it’s best if you don’t find it. Before coming up with this recipe I did a little research online. I wanted to learn all about the fluffernutter. There isn’t much out there to learn, other than some random facts here and there. Some mudslinging about how the original sandwich isn’t that healthy. Scoff scoff. Everyone’s a critic. 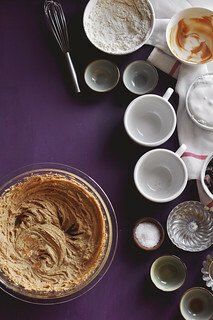 What’s not healthy about white sandwich bread, spread with peanut butter and marshmallow fluff? I just don’t get it. People be craaaaazy. That sounds pretty healthy to me. I did, however, come across an old commercial for marshmallow fluff and the fluffernutter in general, on youtube. I thought it was pretty cool, so I’ll include it at the end of this post. You can thank me later. 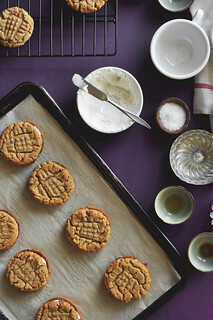 In the meantime, I hope I’ve convinced you to try out these cookies. 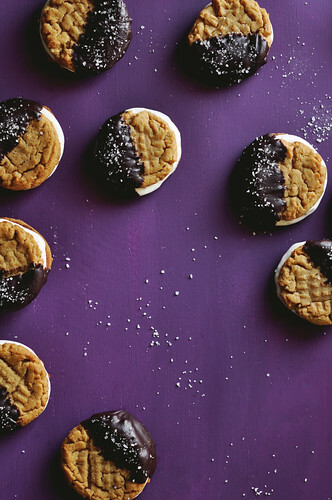 It’s pretty much the ultimate cookie sandwich. Party in your mouth. Enjoy! 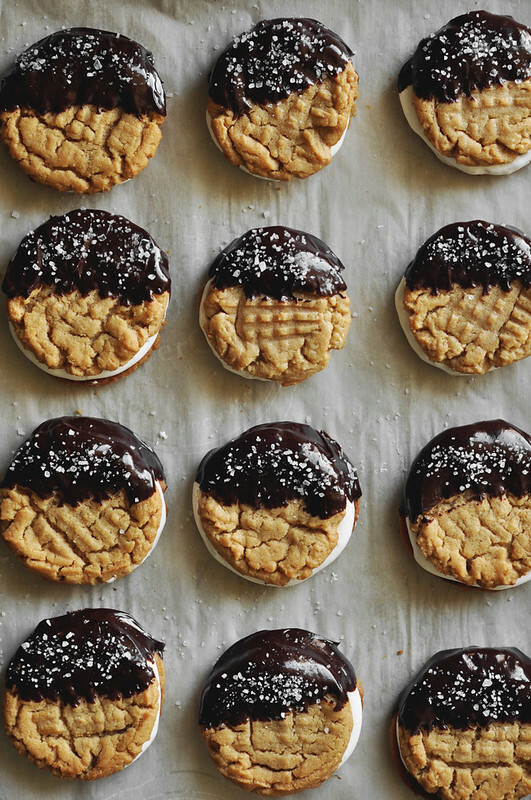 Honey roasted peanut butter cookies are sandwiched together with marshmallow fluff, dipped in dark chocolate ganache and sprinkled with sea salt. 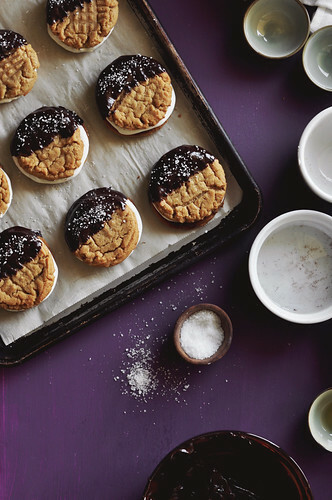 The classic fluffernutter sandwich gets transformed into cookie form. 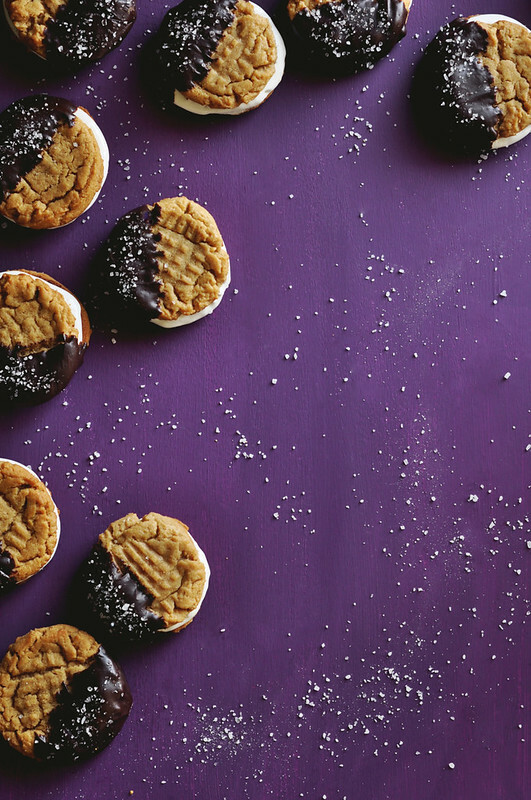 These delicious cookies are perfect to keep in the freezer for whenever you want a tasty treat. Which for me, is always. Preheat oven to 350°F. Line two baking sheets with parchment paper, and set aside. 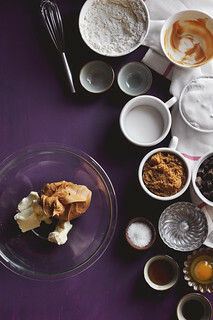 In a large mixing bowl, cream together the butter and peanut butter, until smooth and creamy. Add the sugars and whip on high until fluffy. Stir in the egg, vanilla extract and honey. Add the dry ingredients and mix until just incorporated. Scrape down the bottom and sides of the bowl as needed. Cover with plastic wrap and chill in the fridge for at least 30 minutes, to firm up. 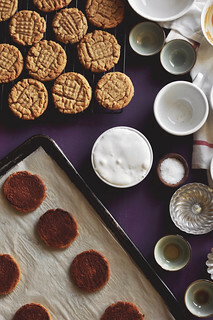 Using a small ice cream scoop, portion out the dough onto the prepared baking sheets, about 8 cookies per sheet, leaving enough space for spreading during baking. Flatten the dough balls lightly, with the palm of your hand. 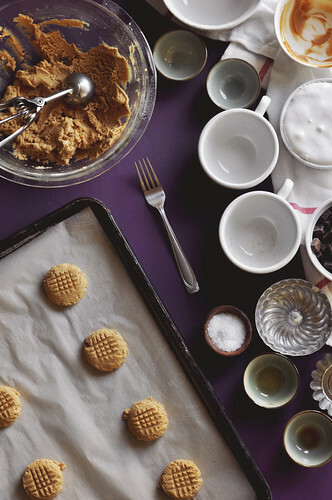 Using a fork, make a criss-cross pattern on top of each cookie. Bake for about 10 to 12 minutes or until golden brown around the edges. Remove from the oven and allow to cool on the baking sheets for a bit, before transferring onto wire racks to cool completely. Once cooled, spread half of the cookies with marshmallow fluff. Sandwich with the other half of the cookies. Place them in the freezer to allow to firm up a bit, to prevent sliding. 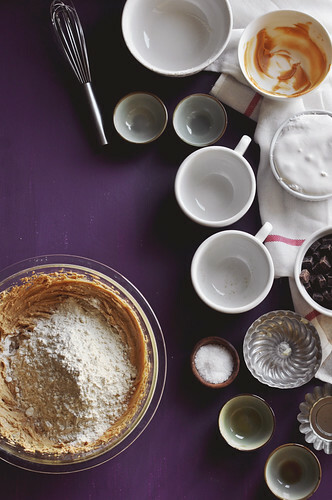 In the meantime, make the ganache. 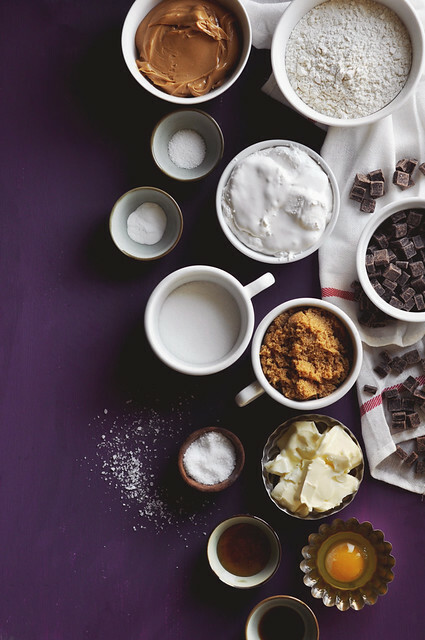 Throw the dark chocolate into a small bowl. Pour in the hot heavy cream and let sit for a few minutes. Whisk until the chocolate is completely melted and smooth. 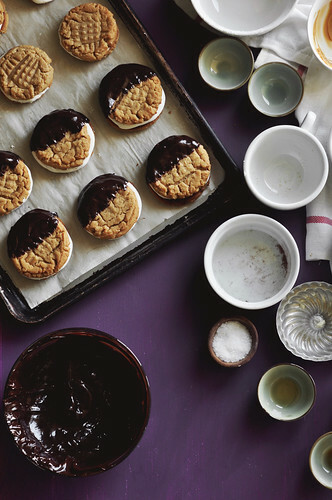 Dip the set cookie sandwiches, partially, into the chocolate ganache. Place back onto the baking sheets. Sprinkle with sea salt and freeze for a bit to allow the chocolate to harden. Eat cold or at room temperature. 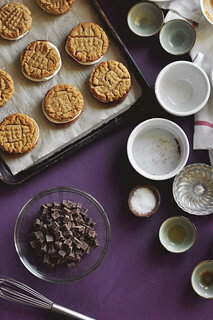 Store leftover cookies in the freezer or fridge. Will keep for about 4 days. Enjoy! Adapted from Peanut butter cookie adapted from Tara O'Brady. Oh, stop. All this goodness. YUM. Oh my god these look incredible. I don’t think it can get much better, peanut butter, chocolate, marshmallow and sea salt! Incredible. New — BIG — fan over here via Billy @ Wit & Vinegar! OMG to these cookies. I can’t even. Must make and eat all. 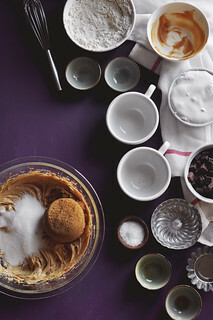 The Candid Appetite is one of my favorite food blogs!!! Great job Jonathan! Keep up the great work and hilarious writing!